For over thirty years, a group of like-minded people around Frodsham have sought to work together to support each other in friendship and Christian faith. Advent Study Groups look again at the story of Christmas in the Bible. Christmas Journey. Ready for Advent (the time leading up to Christmas), Christians from all the local churches work together to present Christmas Journey. A united service at St Laurence's for everyone in Frodsham, including members of all the churches, is held on the first Sunday after Christmas each year. There is usually a New Year's Eve service at St Laurence' followed by a torchlight procession to the top of Frodsham Hill. Week of prayer for Christian Unity. Every year the dates are the same, 18th to 25th January, regardless of the days of the week. Praying for unity does not involve prayer for any specific schemes for unity. It is about being faithful to the prayer of Jesus Christ, as seen in the Gospel of St. John Chapter 17: 'that they may be one'. Part of this prayer is quoted in the Frodsham Churches Together logo at the head of this page: "May they be brought into complete unity to let the world know that you sent me and have loved them even as you have loved me." (St. John's Gospel, Chapter 17, Verse 23). Lent meetings to look afresh at the Bible, pray together and get to know each other a little better. Lent starts on Ash Wednesday. Easter Journey. Following on from Christmas Journey a similar Easter Journey is presented by members of all the Frodsham churches. On Good Friday we meet at Eddisbury Square and follow a cross up to St Laurence where we join the children who have been engaging in their own Good Friday activities. 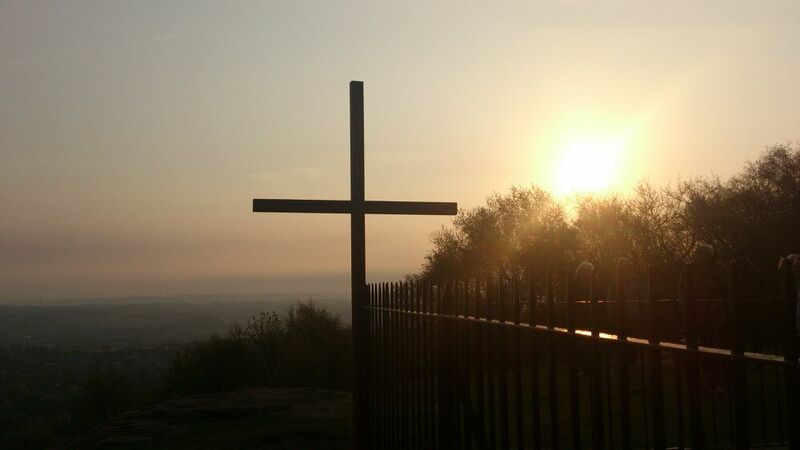 On Easter Morning we have a sunrise service on Frodsham Hill followed by a shared breakfast at Frodsham Methodist Church. Christian Aid Week seeks to meet the needs of the poor of the world. Envelopes are distributed to houses and collected by volunteers from the churches. Read an article about support for Christian Aid in Frodsham. Frodsham Churches Together newsletter is sent to each house in Frodsham three times a year. You could also speak to one of Frodsham Methodist Church's representatives to Frodsham Churches Together: Mrs Patricia Barnard, Mrs. Elizabeth Holmes & Mrs. Marion Greer. Alternatively, visit the national website of Churches Together.